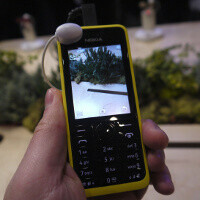 The Nokia 301 is a new feature phone running on Series 40, but borrowing design clues from the Lumia smartphone range. It takes pride in having a good camera in a traditional feature phone form factor, which is a bit of a rarity. The camera on the Nokia 301 is a 3-megapixel one, and it supports features like voice-guided self-portraits and other neat tweaks. You can also take photos in a quick sequence with burst mode and even compose panoramic shots. The device is clearly not in a position to compete with good cameraphones, but it is a step above the traditional experience in feature phones. The Nokia 301 can also stream videos from YouTube on the go, quite the feature for such an entry-level device. It supports 3G HSPA connectivity as well. Overall, it is a colorful slab of plastic with an alphanumeric keypad, and with a fairly solid battery life as one of its main benefits. Otherwise, we are looking at a 2.4-inch display on this device. Pre-loaded apps include Facebook and Twitter. The Nokia 301 is expected to launch in Q2 2013 across the globe and mostly in emerging markets with a price of around $85 (65 euro) off contract. It definitely has a chance to get noticed there. Basically a Nokia for deadbeats that doubles as a hammer. Just because someone wants a cheap phone doesn't make them a deadbeat. Elderly folks on fixed income, those in the range of poverty, and also those in developing nations where just a portable phone is a novelty can appreciate this. Is it a dual active sim like samsung ? yes better phone than others like iphone, samsung galaxy etc. simple very good not complicated the user.